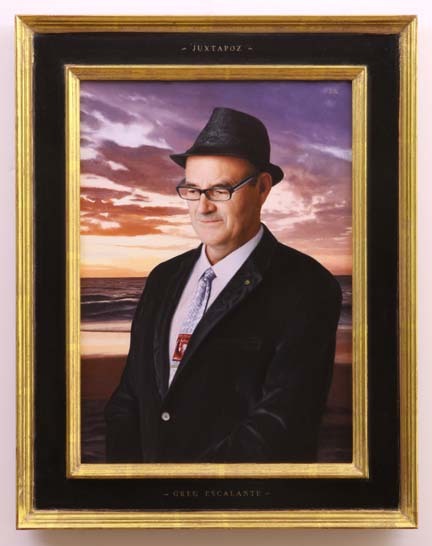 Two years ago, as part of his preparation for painting an oil portrait of art dealer Greg Escalante, artist Jon Swihart took some photos of his subject: LOTS of them. "The session went on for two hours," Escalante recalls, "and near the end I started goofing off." Swihart came away from the shoot with dozens of digital images of Escalante including some in which Escalante mocked his own vanity by taking selfies. "Greg loves to laugh," Swihart recounts, "and the whole thing was really just a lot of fun." When it was all over, Escalante didn't give the photos a second thought: "I just forgot about them." he states. The painted portrait that came out of experience was everything that Escalante expected and more. Escalante, who feels strongly that Swihart is one of today's greatest painters, knew that Swihart had a reputation for producing flawless, mesmerizing portraits, and that is exactly what he got. Although the image was meant as a joke between friends, Escalante put the image on Instagram, and the reactions came quickly: it was really funny. Of course, some also took the image seriously -- as art even -- and the image ended up on display in an Arizona museum as part of an exhibition about guns in art. 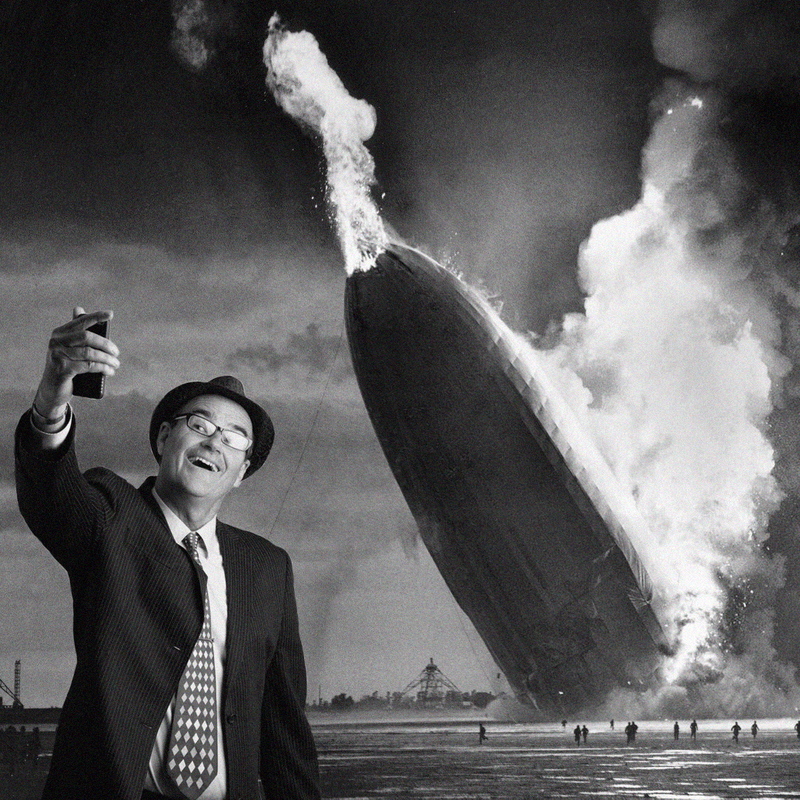 Since the appearance of that first "selfie" Swihart has created well over 150 more images, placing Escalante in iconic photos, in the presence of celebrities and disasters, and has also inserted him into famous works of art. After an intense day in the painting studio, Swihart says that photoshopping the selfies are a way of "unwinding." Escalante agrees: "For Jon, making one of these is like smoking a cigarette." 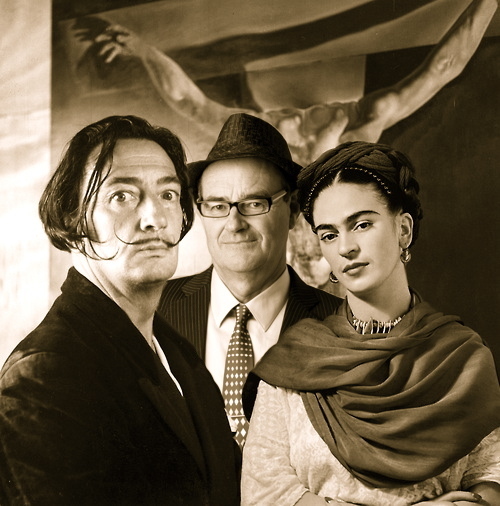 Many of the images have the flavor of time travel, including one that Escalante particularly savors: "The one with Dali and Frida Kahlo is my favorite," he explains, "I wish that had happened." 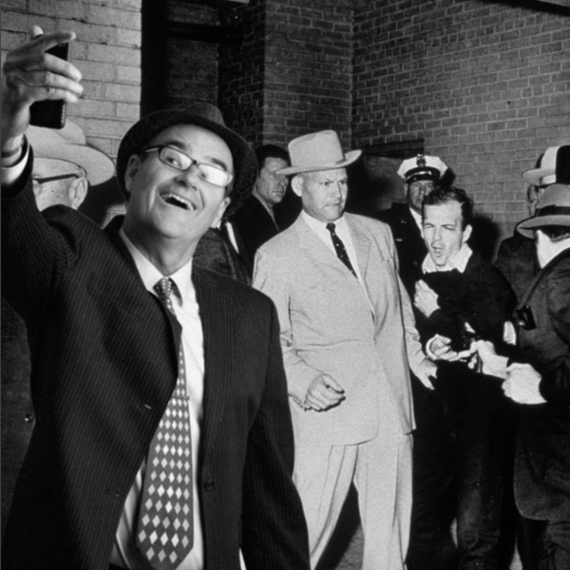 The "selfies" series has given Greg Escalante and his friends a lot of laughs: it's a gag-gift that keeps on giving. 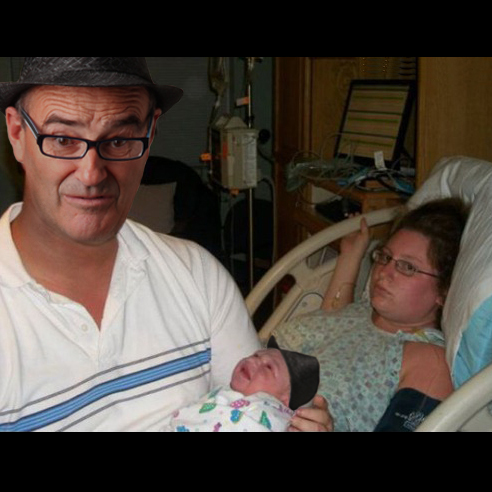 In one offshoot of all this Escalante even has a new family that includes a baby boy -- Mofo -- born into the world with an Escalante hat and glasses. In subsequent images, Escalante's new "family" even includes a possum and a coyote. For Jon Swihart, the whole project has been a lark, and also a reputation changer. When he attends art openings and people say "I'm a big fan of your work" it is often the Instagram selfies that they are talking about, not his paintings. At the Gregorio Escalante Gallery in Chinatown, where 40 of the selfies are now on display along with a selection of Swihart's oils something remarkable is happening: viewers are breaking into uncontrolled laughter. Greg Escalante, who hears the laughter in his upstairs office reflects that "There are very few shows that make people just laugh out loud. People are laughing like they are at a carnival, from one end of the show to the other." 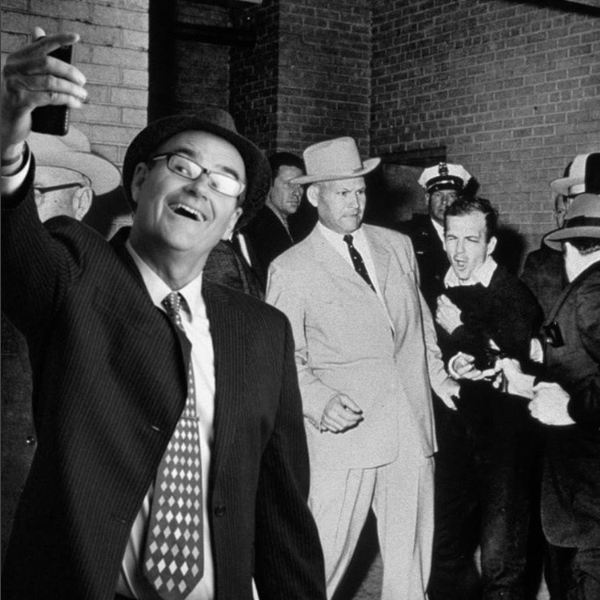 Escalante is a very good sport -- he doesn't mind being the center of all these jokes -- and in the process he has become the "Zelig" of Instagram, with time travel as his reward.